Samsung Galaxy Note 7 has created a lot of Buzz around this year and all that for the wrong reasons and at the end of this year, it seems like Note 7 still have the battery percentage leftover as it again making headlines even after the Samsung has pulled the plug off from it. On Tuesday, a passenger attempted a prank that went horribly wrong in Virgin Airlines turning into long flight drama that almost turned into a full-blown 3 a.m. diversion. 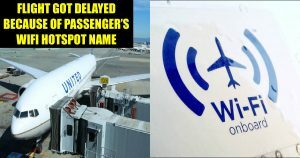 A passenger on a Virgin Airlines flight from San Francisco to Boston reportedly created an emergency situation for the crew and fellow passengers as he created a Wi-Fi hotspot with name “Galaxy Note 7_1097” during the flight. As the infamous Samsung smartphone was earlier banned from all US airlines due to the explosion cases reported against it, the hoax ended up creating a panic situation. After realizing that there was a Wi-Fi hotspot with Galaxy Note 7 name on the flight, the crew asked the passenger with the phone to press their call button, as per a report by BBC. “This isn’t a joke. We’re going to turn on the lights (it’s 11pm) and search everyone’s bag until we find it,” the crew was quoted as saying in the report, citing a passenger onboard – a Twitter user named Lucas Wojciechowski. When nobody pressed the button, the pilot had to get involved in the situation and warn the passengers that the flight will have to make an emergency landing if nobody claimed responsibility for Samsung Galaxy Note 7 smartphone.